No need to pack your own banana unless you plan to eat it before the race. I always feel guilty eating fruit that has to travel so far to get here. But if the banana crisis (http://tinyurl.com/kou93zg) comes to pass, those post-race tables will need to groan under some other perfect fruit. Sleep more in the days leading up to the event. A sleepless night before a race is OK and usually inevitable. But try not to have an overall sleep deficit. Eat 2nd breakfast. Despite the 3:30am hearty serving of oatmeal, I was not well fueled. Also, do a better job of gently carbing up in the days before. Get over feeling dorky about wearing a water belt. Sometimes it is nice to glide by crowded water stations. Get over fear of mid-race pit stops. It’s not like I am some elite athlete where an extra minute or two is going to make that much of a difference. Per above, study the route map for porta-potty locations. Don’t pack bananas unless I plan to eat them pre-race. 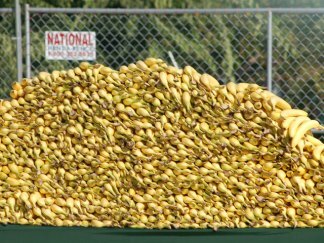 There are mountains of potassium to be had after the finish line and bananas are gross after being cooped up in a bag for hours. Run negative splits. . .according to my own pace abilities. Until I improve my speed, I need to concede that my pals are faster than I am, and forgo in-race company and conversation. STRETCH! ICE! POP ANTI-INFLAMMATORY PILLS! Take niggling injuries more seriously before they became debilitating. Oh, and turn up the training. This is a great list… here’s a few more from my experience of the same race. — Unwrap the energy chews before the race. I’m not good with cellophane in the best of times, and especially not when galloping and panting along during the race. — Take it easy the day before the race. I read all this advice about how long to space your last long run before race day — a week or more. But then I foolishly spent the day before the race cleaning my house (like, scrubbing), dragging the kids all over the place on my bike, and dancing. Yes, dancing. Combined with a mostly sleepless night, it was a recipe for exhaustion before I even hit the starting line. — I agree about the water bottles. — This may be a point of contention, but I think I should have popped in my headphones for the last two or three miles. By that point the runners were very spread out, I was too exhausted for conversation, and all I could hear was the sound of my feet and heart and lungs pounding. I started singing the ABCs to myself just to distract from the misery inside my body. — Bring fresh EVERYTHING for post-race. Fresh bra, undies, socks, clothes and an extra layer to account for the inevitable post-race chill. Especially on the blue line. Why is the blue line always so cold?